Kentucky beats Notre Dame: The Fighting Irish should have intentionally fouled the Wildcats. 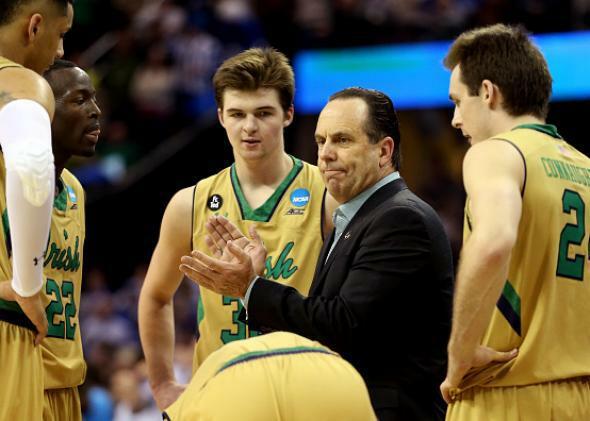 Notre Dame should have intentionally fouled Kentucky in the Elite Eight. Head coach Mike Brey of the Notre Dame Fighting Irish huddles with his players late in the second half against the Kentucky Wildcats. Over the summer, inspired by events in last year’s Elite Eight, I investigated whether it was feasible to foul when the game is tied and the shot clock is off. There are many things to consider when determining if the strategy has merit. The tl;dr version of my analysis is that if the defending team doesn’t have a great chance to win in overtime and the offense is in the single bonus, the math often works out in favor of fouling. Especially if the offense has poor free-throw shooters. For example, if you’re N.C. State against Houston in the 1983 title game, it’s the smart move. Jim Valvano’s club refused to let Houston have the last shot in a tie contest, and even after a rather poorly executed final possession of its own, won it … on the dunk. Notre Dame found itself in a similar situation in Cleveland before ultimately losing to Kentucky 68–66 on Saturday night. The undefeated Wildcats had the ball after an Irish turnover in a tie game with the shot clock off and just under 35 seconds left. As with N.C. State, Notre Dame did not have probability on its side. First, the Irish had to stop the Wildcats with their overmatched defense, and second, it had to outscore Kentucky over the ensuing five minutes of overtime, where Kentucky would probably have the first possession due to its nation-leading prowess in winning jump balls. The other option to waiting for Kentucky to take the final shot was for Notre Dame to intentionally foul Andrew Harrison, the first Wildcat to touch the basketball, and (theoretically) give itself the final possession with a chance to win the game. Barring an offensive rebound, the upside of that play is that one of the nation’s best offenses, already having the most efficient game that a Kentucky defense had seen this season, would have a chance to decide the outcome. There are two pieces of information we need in order to evaluate the fouling option. First, we need to estimate Kentucky’s chance of rebounding a missed free throw. Nationally, teams grabbed about 13 percent of their free throw misses last season. The Wildcats are one of the best offensive rebounding teams in the country and Notre Dame is poor at rebounding opponents’ free throws compared with other power-conference teams. At the same time, Kentucky was not in a desperate situation and probably wouldn’t have sold out for an offensive board for fear of fouling. I’d give them a 20 percent chance of rebounding a missed free throw. We also need to estimate Notre Dame’s chance of winning by playing defense. The betting markets had the Irish at about 12 percent to win before the game. Based on this specific matchup and according to my win probability model, the Irish would have had a 20 percent chance of winning by playing defense. This figure is based on historical data and accounts for the small possibility that the Irish would get the ball back anyway—which they ultimately did trailing 68–66 with six seconds left—and the larger possibility of overtime. The decision would have been a mathematical no-brainer had Kentucky not been so good at free-throw shooting. Point guard Andrew Harrison, who took the ball up court on the final play, had made more than 78 percent of his attempts this season. Still, assuming Harrison would have been fouled early in the possession, Notre Dame’s chance of winning would have improved to about 23 percent. That’s a boost of 3 percentage points, and there are few decisions a coach can make that will improve his team’s chance of winning by that much. It is fair to wonder whether the Irish truly had just a 20 percent chance to win by playing defense, considering we had just seen them go toe to toe with UK for more than 39 minutes. Based on my calculations, it turns out that fouling would have been the optimal strategy even if we assumed Mike Brey’s team had as much as a 27.5 percent chance to win by playing defense. Actually, the break-even point is probably greater than that because my framework doesn’t consider that the Irish were much better on offense than defense. It’s important to note that in 615 cases over the past five years, the defending team has won 34.5 percent of the time, and presumably most of those games involved more competitive matchups than Notre Dame vs. Kentucky was expected to be. So it’s hard to imagine Notre Dame’s chances at higher than 30 percent by playing defense. It’s understandable that a coach that has seen his team play an opponent evenly wouldn’t feel like a huge underdog, and perhaps I’m underestimating Notre Dame’s chances. Given that fouling will be heavily criticized if the team loses—and the defending team will probably lose regardless of the strategy chosen—few coaches are in a position to risk their reputation in this situation, even if a close examination of history suggests there are times when it is correct to do so.